Drones have received some pretty bad publicity over the past decade. When we talk about drones, we generally do so in a military context, which isn't all that surprising considering what information we have been most exposed to. The media has painted a picture in our minds – drones are robotic killing machines. But in all reality, drones aren't just for blowing things up. In fact, drones hold a wide range of applications in various industries including weather monitoring, aerial mapping, law enforcement, wildfire surveillance, and media coverage. Despite what you see on the news, drones can actually be quite friendly. In a recent study, the Association for Unmanned Vehicle Systems International (AUVSI) estimated that drones will add 100,000 new jobs and $82 billion in additional economic activity between 2015 and 2025. Drones are even working to provide the food on your dinner plate. Among the many applications for drone use, precision agriculture stands to generate the largest commercial impact. Although farms used to be small enough in size for human and ground-based surveillance, consolidation has led to massive fields that cannot be traversed by land in a timely manner. Instead, farmers now need to view their land from the sky. This point of view can be obtained with satellite imaging, planes, or helicopters. However, these methods provide low resolution images and are very expensive. Autonomous imaging drones offer a better service at a cheaper price, which is exactly why the AUVSI expects precision agriculture to see substantial growth in the next two decades. Autonomous farm drones can take off, fly, and even land without human assistance. These drones are used to survey large farms to increase efficiency and productivity in several ways. Drones allow farmers to spot diseases and general problems with their crops faster than with satellite or conventional aerial imaging. These drones can be deployed on site daily due to their small size and, more importantly, low expense. Drones can also provide more accurate imaging due to low flight altitude. Drones fly below 400 feet and can collect and stitch together high resolution images to create a precise view of entire fields. By providing information in a more accurate and timely matter, drones allow farmers to respond to problems faster. The information collected is also useful in saving resources – infrared imaging allows for targeted treatment of crops. When a plant is damaged, one of the first things to go wrong is the production of chlorophyll. Chlorophyll operates as a critical component of photosynthesis, absorbing light and converting it into energy for the plant. Consequently, damaged plants absorb less light, allowing drones to find affected areas with infrared imaging. This method of surveillance allows farmers to specifically target diseased and damaged areas instead of spraying the entire field with disinfectant or water. By only focusing on affected areas, farms earn a large financial benefit through reduced operating costs. The only reason this industry has not yet boomed is because current restrictions prevent individuals from flying drones for commercial purposes. However, recent federal legislation from Congress mandates that the Federal Aviation Administration (FAA) open the National Airspace System to commercial drone flights by 2015. The FAA will still regulate the use of drones, but it needs to offer some form of commercial benefit. The majority of controversy surrounding drone use in the United States has been based on safety and privacy concerns. Luckily for the precision agriculture industry, these issues are largely irrelevant. Farmer drones will not interfere with federal airspace because they fly at low altitudes. Furthermore, farm drone use creates minimal privacy concerns due to operation in areas with low population. 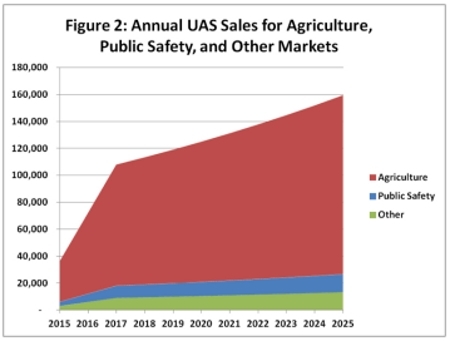 Because farms are not located in highly populated areas, and because of the economic benefits drones offer, it is highly unlikely the FAA will continue to regulate commercial drone flights in a way that hinders the use of precision agriculture. When the market opens in 2015, this will provide drone manufacturers with a massive generation of new revenue. 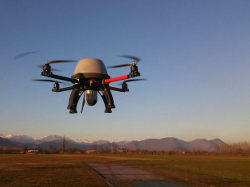 Companies focused on small Unmanned Aircraft Systems (UAV) are set to reap the benefits. Manufacturers like Boeing Co. (NYSE: BA) and Textron Inc. (NYSE: TXT) are already testing precision agriculture non-commercially. However, Boeing and Textron are far from pure plays. Look to AeroVironment (NASDAQ: AVAV), the leading producer focused specifically on small drones, to grow significantly as precision agriculture skyrockets. 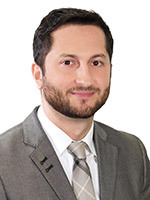 Energy and Capital's tech expert, Jason Stutman has worked as an educator in mathematics, technology, and science... Before joining the Energy and Capital team, Jason served on multiple technology development committees, writing and earning grants in educational and behavioral technologies. Jason offers readers keen insights on prominent tech trends while exposing otherwise unnoticed opportunities.